En español: ¿Cómo sabemos que la actividad humana es la principal causa del cambio climático? Earth's surface has undergone unprecedented warming over the last century, and especially in this century. As any farmer can tell, the natural patterns of climate have been altered. We know that warming—and cooling—has happened in the past, and long before humans were around. Many factors (called “climate drivers”) can influence Earth’s climate—such as changes in the sun’s intensity and volcanic eruptions, as well as heat-trapping gases in the atmosphere. But, what’s causing today’s unprecedented warming — are humans part of the cause? Scientists have devised different methods to answer this question. Meteorologists and oceanographers compare the climate patterns they observe with patterns developed using sophisticated models of Earth's atmosphere and ocean. By matching the observed and modeled patterns, scientists can positively identify the "human fingerprints" associated with the changes, and they can also attribute the proportion of those changes to human activities. The fingerprints that humans have left on Earth's climate are turning up in a diverse range of records and can be seen in the ocean, in the atmosphere, and on the Earth’s surface. Scientists agree that today’s warming is primarily caused by humans putting too much carbon in the atmosphere, like when we choose to extract and burn coal, oil, and gas, or cut down and burn forests. Scientists have gathered evidence and have improved their methods for teasing apart natural and human factors. Today scientists have very high confidence about human-caused global average surface temperature increase – a key climate indicator. They have reported on their growing confidence through successive climate assessments of the Intergovernmental Panel on Climate Change (IPCC). Carbon dioxide (CO2) is the main heat-trapping gas largely responsible for most of the average warming over the past several decades. The atmospheric concentration of CO2 has increased dramatically, from a pre-industrial era (AD 1000 – 1750) concentration of approximately 280 parts per million (ppm) to today's 400 ppm. Scientists warned for years about this dangerous threshold, but with the accelerated pace of emissions the question changed from whether we would reach CO2 concentrations above 400ppm to when. The Arctic reached 400 ppm in 2012. In 2013 the Mauna Loa Observatory in Hawaii recorded more than 400ppm. 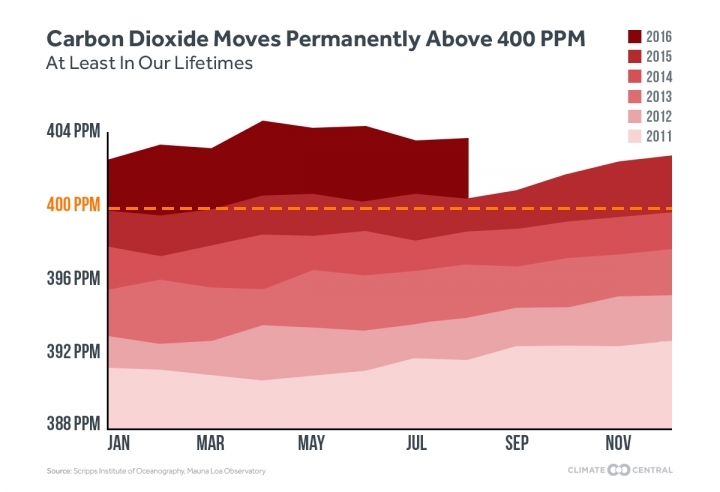 In March 2015 global averages reached this threshold, and in September 2016 the world reached a point of no-return: CO2 concentration levels are unlikely to dip below 400 ppm again. Click to enlarge. Direct Evidence of Fossil Fuel Derived CO2 in the Atmosphere. While the concentration of carbon has increased, the carbon originating from natural sources has decreased. We know human activities are driving the increase in CO2 concentrations because atmospheric CO2 contains information about its source. Scientists can tease apart how much CO2 comes from natural sources, and how much comes from combusted fossil fuel sources. Many natural and human factors (also called drivers) influence the climate. Emissions from cars and power plants and an increase in the amount of radiation the sun emits are examples of "forcings" that drive temperature rise, the first one by trapping heat, and the second one by increasing energy, which translated into heat. Volcanic events and some types of human-made pollution, both of which inject sunlight-reflecting aerosols (i.e., tiny particles) into the atmosphere, lower temperature and are examples of forcings that drive decreases in temperature. A recent study found that “almost two-thirds of the impacts related to atmospheric and ocean temperature can be confidently attributed to anthropogenic forcing” (meaning human caused drivers). 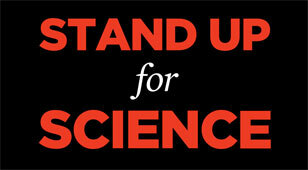 Human activity drives climate change. Natural climate drivers include the energy from the sun; aerosols from periodic volcanic eruptions, dust, and salt spray; natural carbon cycle processes like termite mounds in Africa that emit methane, or tiny organisms in the ocean surface that take up carbon dioxide; and variation in snow and ice cover that change how much the Earth’s surface reflects the sun’s energy back into space (referred to as albedo). 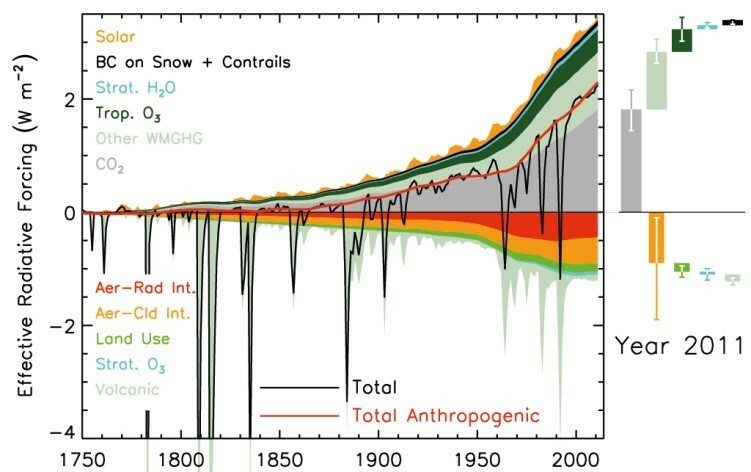 History of Climate Drivers: Heat-trapping emissions far outweigh the effects of other drivers acting on Earth’s climate. Volcanic eruptions account for the cooling spikes seen in the graph in 1883 and 1991. Among natural drivers, a large volcanic eruption can have a sharp cooling influence as it spews tiny particles high into the stratosphere (the layer of the atmosphere above the troposphere where weather typically occurs). The massive explosions from Krakatoa (Indonesia) in 1883 and Mount Pinatubo (Philippines) in 1991, for example, can be seen as the two largest downward spikes in the volcanic data depicted in the figure to the right. These particles prevented the full energy of the sun from reaching the surface of Earth and created a cooling trend for several years. 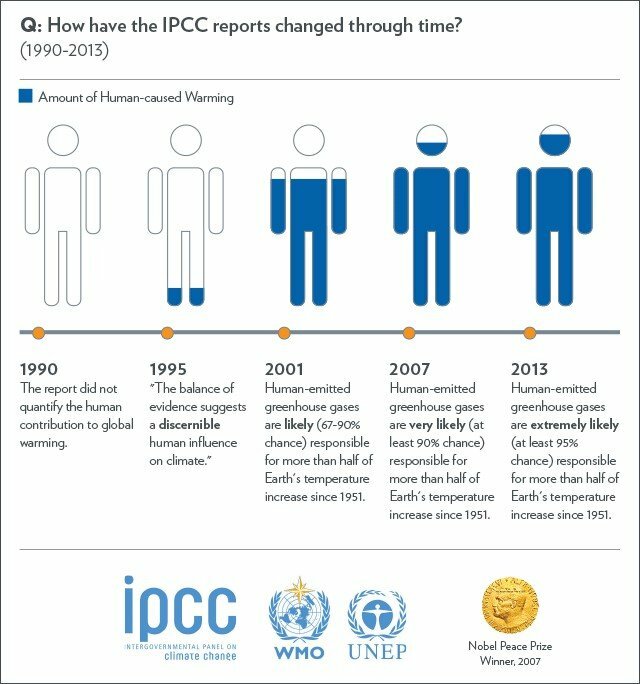 Human climate drivers include heat-trapping emissions from burning coal, gas and oil in power plants and cars; cutting down and burning forests; tiny pollution particles (aerosols); black carbon pollution more commonly referred to as soot; and changes in land use that also affects Earth’s albedo. 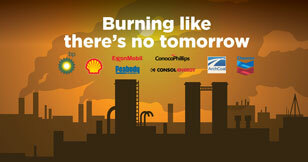 Fossil fuel burning by humans emits tiny particles in addition to releasing CO2 in the atmosphere. Some particles reflect sunlight back to space (aerosols), similar to the volcanic particles, having a cooling effect. Other particles such as soot (black carbon) absorb the sunlight and drive temperature rise, leading to local warming of the atmosphere level where the soot particles circulate. Both types of human-created particles lead to a decrease in the amount of the sun’s energy reaching the surface of the Earth. Very likely, there would have been even more warming in the past 60 years if it were not for these human-made and natural tiny particles. Some of these climate drivers result in warming and others lead to cooling, but when all the natural and human-induced climate drivers are stacked up and compared to one another, the accumulation of human-released heat-trapping gases in the atmosphere is so large that it has very likely swamped other climate drivers over the past half century, leading to observed global warming. Much as the Air Force develops computer programs to simulate aircraft flight under different conditions, climate scientists develop computer programs to simulate global climate changes under different conditions. These programs use our knowledge of physical, chemical, and biological processes that occur within Earth's atmosphere and oceans and on its land surfaces. Mathematical models allow scientists to simulate the behavior of complex systems (like climate) and explore how these systems respond to natural and human factors. When models take into account both natural and human drivers, they better reflect the observed changes in temperature. For a computer model to accurately project the future climate, scientists must first ensure that it accurately reproduces already observed temperature changes (i.e., they need to test if they work well). The scientists working on the IPCC assessments have carefully documented observed changes in air temperature, ocean temperature, ice retreat, and sea level rise since the past century. 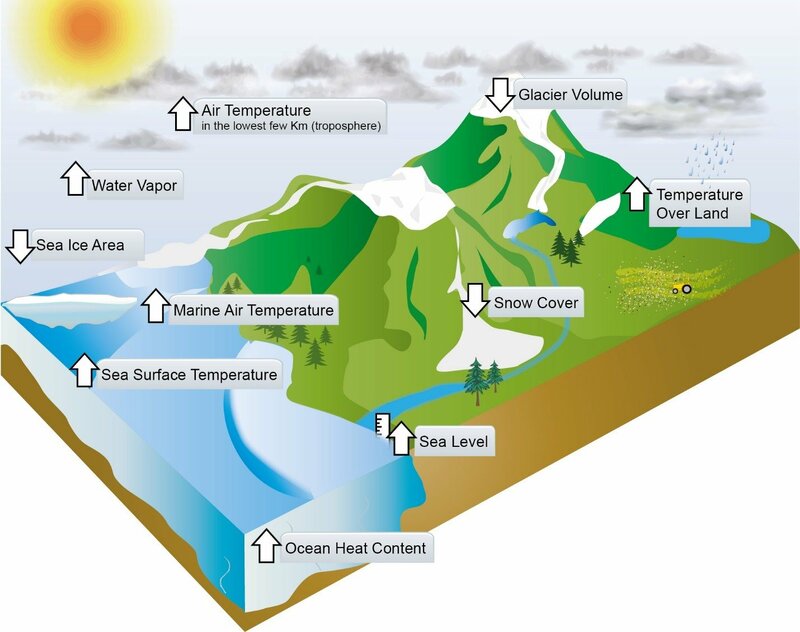 Scientists use climate computer models to compare these observed changes with natural climate drivers and human climate drivers. Scientists reached this conclusion after contrasting observed changes to different types of drivers. When climate models include only recorded natural climate drivers, the models cannot accurately reproduce the observed warming of the past half century. When the models also include human-induced climate drivers, then they accurately capture recent temperature increases in the atmosphere and in the oceans. And when all the natural and human-induced climate drivers are compared to one another, the dramatic accumulation of carbon from human sources is by far the largest climate change driver over the past half century. Confidence in attribution per type of event. Over the years, the models of attribution science have become more sophisticated, and, in addition to attributing global warming to human caused emissions, they are also able to determine the contributions of global warming to extreme events (like floods, heat waves, storms, etc). In 2016, the National Academies of Sciences, Engineering, and Medicine released a report analyzing the state of extreme event attribution science. 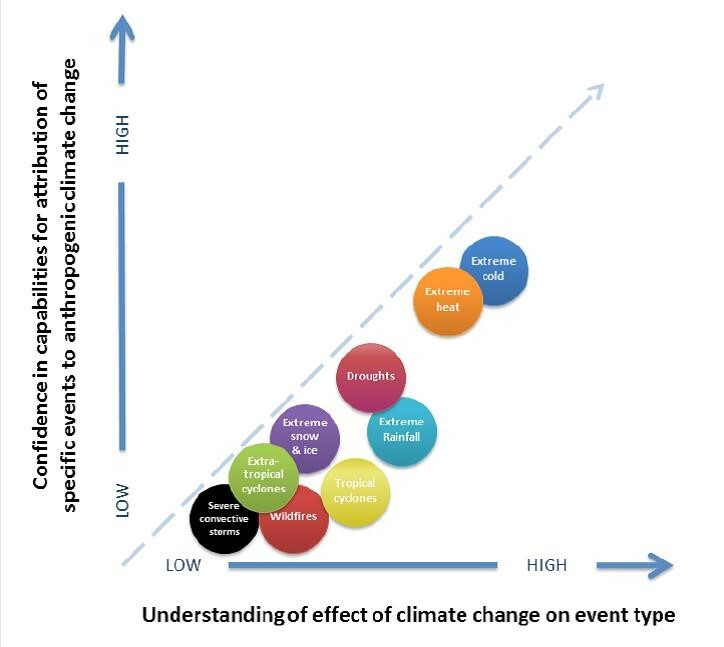 The report showed that scientists can evaluate the effect of climate change on a single extreme event--how human-caused emissions can increase the likelihood of that event to happen. Although attribution science is clearer for some types of events than for others, it is an important step to provide predictive forecasts of extreme events at longer lead times, reducing risks and improving preparedness. We are the cause, we are the solution. Knowing that human activities are the main driver of global warming helps us understand how and why our climate is changing, and it clearly defines the problem as one that is within our power to address. We cannot avoid some level of warming caused by the heat-trapping emissions already present in the atmosphere, some of which (such as carbon dioxide and nitrous oxide) last for 100 years or more. But, with aggressive measures to reduce emissions and adapt to those changes we cannot avoid, we have a small window to avoid truly dangerous warming and provide future generations with a sustainable world. The Paris Agreement of 2015 calls for a reduction in emissions worldwide enough to keep global warming under the dangerous threshold of 2°C. We can reach that goal through immediate and sustained action to reduce our heat-trapping emissions like adopting technologies that increase energy efficiency, expanding our use of renewable energy, and slowing deforestation (among other solutions).